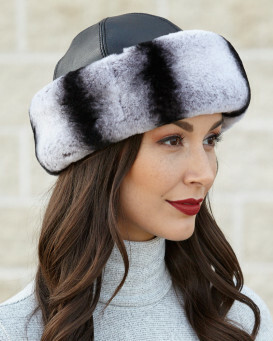 Does the Fur Cuff roll down? 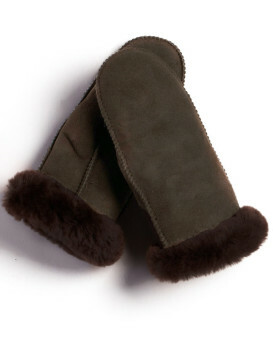 A: The exposed Shearling Sheepskin Cuff on these Mittens is sewn in place, and is not designed to be rolled down. 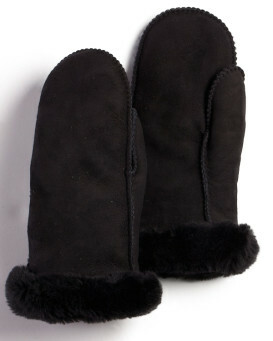 Women's Alaska Shearling Sheepskin Mittens - Black Napa. Thick and durable Napa leather exterior with extra thick sheepskin wool interior. These mitts will definitely keep your hands warm from the cold. Sheepskin is one of natures warmest furs. It keeps your hands warm, but also keeps them dry! Sheepskin items are a great gift for anyone because it can be enjoyed by anyone! "Love, love, love these mittens! 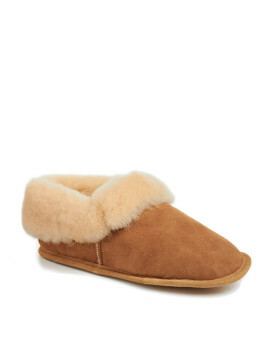 They are so warm and soft, perfect for Colorado winters. I wanted something fancier than a ski mitten, but with durability. I went with the M as my hand measured a 7 1/2 inches. The sizing is perfect. 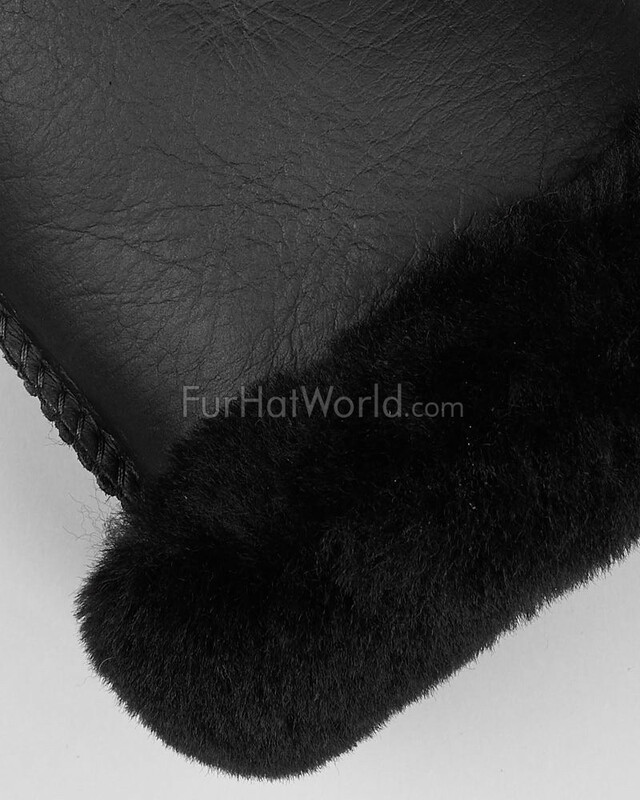 Thanks FurHatWorld for quality products!" "Perfection! I always wear mittens instead of finger gloves because hands stay a lot warmer. They feel a bit stiff but I know the leather will soften with use. Sturdy outside stitching guarantees durability. Ordered medium for 7-½ hand measurement and I'm glad I did. The shearling pile inside is snug so pile will stay close insuring insulation warmth. This is my 2nd purchase of mittens to replace the pair that I lost. I'll never buy anywhere else." "Great mittens. I love wearing shearling boots so I figure these mittens will keep my hands wonderfully warm on a trip I have planned for the coming European winter." "Love them...so cozy.They are a little stiff now but will soften up with wear. Guess texting would be pretty difficult." "Beautiful mitts and very warm. They fit small so I recommend sizing up. I bought medium and they're too small (measured hand etc). They are great mitts and I will be ordering large. There is a warning on the description to size up if you're in between sizes. I recommend sizing up too." "Warm and windproof at -25 Celsius. Enough said." "I love these gloves, keep my hands so warm - excellent buy." "Excellent quality, very warm. I have small hands and I bought size M: perfect choice. 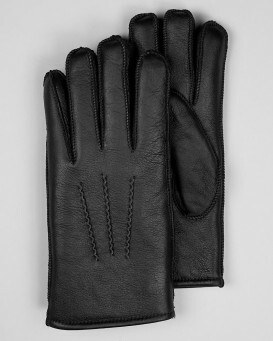 The mittens are roomy enough for my fingers to move freely, but snug not to fall off my hands."